Team MH: Fitness is a passion that’s part of everything you do. When did this start? Nikhil Kapur: Working out has always been a part of my life, whether it was sports like squash, golf or cricket in my teens and then some strength training and roads running in my 20s. Not many know that my dad (ex-army) has been a sportsman all his life. He played Junior Badminton Nationals and Squash Nationals and has been instilling a love for fitness and the outdoors in me and my sister since forever! Does your family share the same love for fitness? My 9 year old son, Kiyan runs, does yoga and tries to have an active day. He shares my love of the outdoors and sports, and we all as a family have a fabulously unique vacation when we participate in Atmantan’s Family Wellness Camp every year. How did the Ironman Triathlon come about? Preparing for and winning an Ironman Triathlon isn’t an easy feat. What was the process of preparing for it? How long did you prepare for it? I gave myself one year to do the full Ironman event (140.6 Miles). I trained for 7 months for Auckland Ironman and then after another 6 months of training I went for the Zurich Ironman. This for me included roughly 10,000 KM of biking, about 300 KM of swimming, and approximately 2500 KM of running a year. I also regularly practice Yoga for recovery and to avoid injury. For my first race, the focus was on increasing my endurance for this 16 hour triathlon. The second onwards was focused on strength and speed. I have one of the best coaches in the business, Nate Llerandi. He’s an American and has represented the US in swimming, cycling and Triathlons. Since 2013, he has always been available over the phone and email and shares the training plan via an app. With him I learnt that I needed a structured plan to prepare for the Triathlon. I got a plan that helped me build my aerobic fitness gradually with enough recovery workouts so as not to break-my-body. My diet is healthy, home-cooked food. Three to four well-balanced meals a day, snack in the form of nuts/fruits/salads, with plenty of hydration. During my workouts, I have upto 500ml of water per hour of workout and consume approximately 200 calories per hour in the form of fruits, organic nutrition bars, energy drinks, etc. What’s a typical workout routine like for you? My routine starts with 1.5-2 hours daily (8-10 hrs/week) to around 25 hrs/week during the peak periods of training. On most days, I have two workouts out of the three disciplines. The training is based on the Heart Rate zones so as to prepare the body for the objective of covering long distances most efficiently. After the first 2 events, the training shifted to building power so as to focus on becoming faster. What were your learnings from your recent participation at the event in Hamburg? 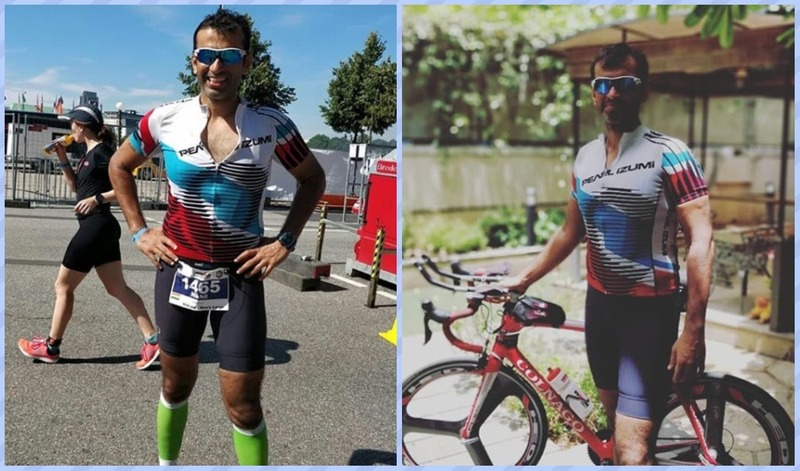 I have done 5 Ironman events so far - the Ironman Auckland 70.3 (Jan 2014), Ironman Zurich 140.6 (July 2014), Ironman Kalmar 140.6 (Aug 2016), Ironman Copenhagen 140.6 (Aug 2017) and the most recent one, Ironman Hamburg 140.6 (July 2018). The most taxing one so far has been the one in Hamburg, which I completed in July. I feel this is the medal I had to work most for. It made me feel like the M in the Ironman logo is for Mental Fitness and it was sheer mental determination and focus because of which I crossed the finish line. My left leg seemed to shut down quite early on the bike course (75km) with cramps and from there on I had to nurse these severe cramps for the rest of the 180km ride, and the 42km run after. While the mind was alert, my physical body was pushed like never before! How about recovery from the hectic regime? Recovery is a scientific process and a compulsory part of every athlete’s training and to me it doesn’t translate into rest. I follow the active form of recovery, which means doing some cross training or doing some of the runs/rides/swims at a low intensity for a shorter duration. This drains out all the lactic acid build up thereby reducing soreness and makes the body fresh. Active recovery improves muscle recovery and muscles become stronger as they know another tough workout is coming soon. How do you deal with the injuries along the way? the best way to deal with injuries is to avoid them. The most serious injury that I had was 5 years ago due to which I couldn’t run for 3 months. Since then I have incorporated physiotherapy and yoga in my schedule. Physio sessions help me strengthen muscles including my vulnerable ones that can be prone to repetitive stress. Yoga is great for recovery, flexibility and balance. What are the other forms of physical activities that you engage in? I love variety which I get when I train from triathlons…run, bike and swim. I also practice yoga. I am an occasional golfer and I love to row when I get to places where this option is there. Being a father to my nine-year old boy defines my life and the decisions I make in it every day. My son, my friends and family are my stress-busters. How important is mental fitness for a competition like this? Mental determination and focus are a must for completing these long distance races. You build mental strength by making sure you tick all the workouts in your training plan. There are ups and downs, but I keep the final goal in mind and keep going. That’s me in my real life too. My father, Brig. Satish Kapur, VSM. As someone who celebrates well-being on a daily basis, what is your mantra for wellness? Moderation is the key to a healthy life. Don’t go extreme since its not feasible.